This morning, while driving to work, I saw a rainbow-colored pillar formed by ice crystals frozen out of furnace exhaust from chimneys. It was very broad - a bit wider than my (large) hand at arms length, with red on the side towards the sun. It was 3 or 4 times taller than wide, went directly up/down with no noticeable tilt (although the sun was close enough to the horizon that an arc segment would've been vertical at its location). I'd estimate that it was around 30 degrees to the side of what would've been the direct line between myself and the sun (behind a hill). I only saw it on one side, but the same hill that blocked my direct line of sight to the sun would've blocked and equivalent object to the other side. I know it wasn't a rainbow because it formed between me and the sun, but there are numerous phenomena that can create similar looking objects with ice crystals and am curious which one I saw. It was visible along the route marked out on this map. The western waypoint is where I first noticed it, I lost sight of them going around the bend just past the turn where the second marker is. Along the highway it was roughly in front of me, originating from the homes around Bedford street west of Solomon Run. The plumes rising from the chimney's were highly visible this morning due to the temperature, but it was the general haze/thin cloud they produced that was scattering the light. I suspect an inversion forms in the area because fog rising after rain/etc often is trapped around that location/elevation. I didn't see anything closer to the sun, but am not sure if the cloud of ice crystals would've extended far enough to be in the correct position. Once I was far enough around the bend to see the sun the glare was bad enough I doubt I'd've noticed anything even if it was there. Using a location of (40.3197753, -78.9135628) and a time of 8:05AM EST I get a solar azimuth of 124.04, and an elevation of 3.63. 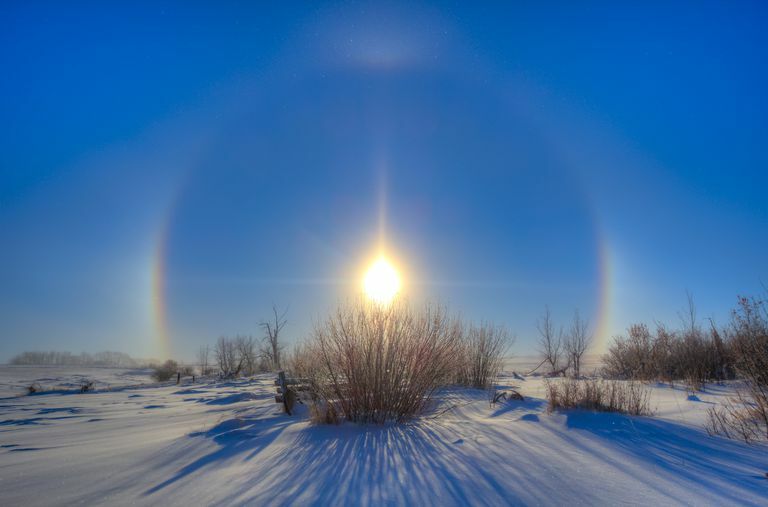 They are called sun dogs, because they follow the sun. It is caused by refraction through ice crystals. There are many related atmospheric phenomena; they are more commonly seen in colder climates. I used to see these regularly when driving east on I-94 on winter mornings, heading for work near Detroit. Usually it was shortly after sunrise. Not the answer you're looking for? Browse other questions tagged visible-light everyday-life refraction diffraction ice or ask your own question. What does high-pressure ice look like? What is this sort of abstract rainbow? Did diffraction bend this light more than 90 degrees?